The promotion is open to all existing CITI Bank, BDO, BPI, HSBC, Metro Bank and Eastwest Bank credit card Holder Principal and Supplementary cardholders ("Cardholders") whose accounts are active and in good credit standing. Promo runs from April 28, 2018 to June 30, 2018. Promo offer is applicable to installment credit card transactions only. 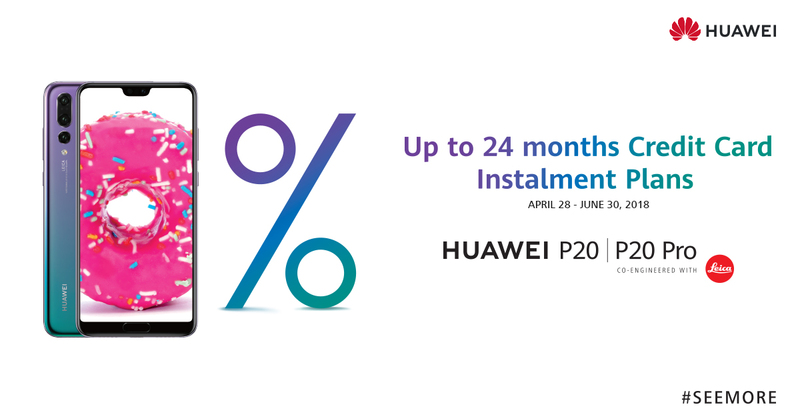 CITI Bank, BDO, BPI, HSBC, Metro Bank and Eastwest Bank cardholders can pay their transactions in installment for 12 months to 24 months on HUAWEI P20 or HUAWEI P20 pro at 0% interest. The offer cannot be exchanged for cash, gift certificates, privileges, rewards and / or other items / products other than the offers indicated above and cannot be availed of with other ongoing promotions of HUAWEI Technologies Co.,Ltd..
Promo offer should be given instantly in the branch where the purchase was made. Any dispute concerning the promo offer and service shall be settled directly between the Cardholder and The HUAWEI Experience Store, HUAWEI Experience kiosk and HUAWEI Retail Partners. In case of dispute in respect of CITI Bank, BDO, BPI, HSBC, Metro Bank and Eastwest Bank credit card only and the customers’ eligibility and availment of promo, the decision of CITI Bank, BDO, BPI, HSBC, Metro Bank and Eastwest Bank credit card with the concurrence of DTI shall be considered final. However, if dispute involves The HUAWEI Experience Store, HUAWEI Experience Kiosk, HUAWEI Retail Partners and its performance and / or delivery of services and / or products to customers, subject to the Promo Mechanics stated above, the decision of CITI Bank, BDO, BPI, HSBC, Metro Bank and Eastwest Bank credit card and HUAWEI Technologies Co.,Ltd. with the concurrence of DTI shall be considered final. 0% interest is applicable if the cardholder pays his / her monthly installment in full. 0% Installment is subject to CITI Bank, BDO, BPI, HSBC, Metro Bank and Eastwest Bank’s approval. The approved installment transaction is automatically deducted from the cardholder’s available regular credit limit. If cardholder decides to pay the installment plan in full before maturity, a pre-termination fee of Php500.00 or 5% of the unpaid principal amount, whichever is higher, will be charged.